Standardised surveys are essential for monitoring populations and identifying areas that are critical for conservation. 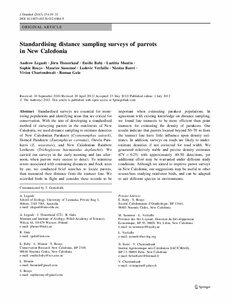 With the aim of developing a standardised method of surveying parrots in the rainforests of New Caledonia, we used distance sampling to estimate densities of New Caledonian Parakeets (Cyanoramphus saisseti), Horned Parakeets (Eunymphicus cornutus), Ouv閍 Parakeets (E. uvaeensis), and New Caledonian Rainbow Lorikeets (Trichoglossus haematodus deplanchii< 0.25) with approximately 40� detections, yet additional effort may be warranted under different study conditions. Although we aimed to improve parrot surveys in New Caledonia, our suggestions may be useful to other researchers studying rainforest birds, and can be adapted to suit different species or environments.